On April 11th JoVE (Journal of Visualized Experiments) will publish a new video article by Dr. Aydogan Ozcan demonstrating how a cell phone camera can capture images from a fluorescent microscope and flow cytometer, which will make it possible for areas with limited resources to easily run tests such as checking for contaminated water and monitoring HIV positive patients. In the new video article electrical and bio engineers from the University of California Los Angeles show the construction of the device and how it can be modified to fit any cellphone with a camera. The team expects the device to be helpful to doctors and scientists in countries with limited supplies and in fast-paced clinical environments. "There is a huge need for these [miniaturized] devices. Resource poor countries demand compact, cost effective and light weight devices to replace bulky equipment common in our labs and hospitals," Dr. Ozcan explains. "These devices bring the diagnostic, testing, and microanalysis capabilities of larger machines to your cellphone." Flow cytometry is a way to count and characterize cells in a liquid sample, and was first developed by Wallace H. Coulter in 1953. Since then, flow cytometry has become ubiquitous in scientific research, particularly in the fields of molecular biology, pathology, and immunology. 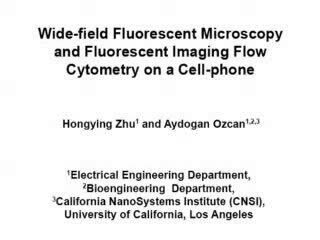 Dr. Ozcan's device brings fluorescent microscopy and flow cytometry, two widely used tools in biomedical research, to the common cellphone. The vast network of cellphone subscribers around the world, estimated by the United Nations to top 6 billion subscribers, provides a massive infrastructure to be able to conduct complex biological tests. Dr. Ozcan's device can be constructed for less than $50 plus the cost of the cellphone, while full sized fluorescent flow cytometers can cost more than $150,000 and require expansive lab space to operate. "A cellphone has almost the computing power of a super computer of the early 1990s, and with over 6 billion cellphone subscribers in the world there is a massive cost reduction to owning a cellphone. That is exactly why I and my colleagues are trying to deploy these micro-devices to cellphones." Dr. Ozcan and his colleagues have filed more than 20 intellectual property licenses as part of Holomic LLC, a startup focused on the development of laboratory equipment for mobile devices. Dr. Nandita Singh, senior science editor at JoVE, says of Dr. Ozcan's publication "We are very excited to publish this inexpensive cell phone based technology platform that enables the detection of white blood cells to monitor HIV positive patients in geographical regions with limited resources. This technology can also be extended to detect E. Coli contamination in water and milk supplies."